The Chinese tech work ethic is punishing and it has paid off in relatively short time. But the trade-offs expected of employees, investors, workers and citizens would not be acceptable in the US - and some are questioning whether they are sustainable in China. China has become a tech rival to the United States in barely two decades.Silicon Valley once saw China as a copycat, but it now has some of the world’s biggest and most powerful internet companies. It has more unicorns, or privately held companies with valuations of over $1 billion, than the United States. The China offices of venture capital firms now manage bigger funds than their American headquarters. One Chinese technology executive said he worked 14 to 15 hours a day at least six days a week. Another said he worked every waking hour and forced himself to watch movies to relax. The reaction from a group of Silicon Valley executives: Wow. “We’re so lazy in the U.S.!” blurted Wesley Chan, a venture capital investor, on the first day of what would be a weeklong journey into the Chinese technology scene. Work habits weren’t the only sharp difference between the Valley and China. By the end of the week, a group of American executives and investors found an alternate tech universe. It resembles Silicon Valley superficially. Look closer, and it becomes a futuristic yet closed-off world that can be equally impressive, alienating and dystopian. Chinese technology executives, they found, were even more driven and more willing to do whatever it takes to win. But that comes with major trade-offs, and punishing work schedules are only the beginning. They found Chinese tech executives to be less reflective about the social impact and potential misuse of their technologies, a potentially worrisome quality in a country with loosely enforced privacy laws, strict government censorship and a powerful domestic surveillance apparatus. In August, Mr. Chan, Mr. Goldberg and 11 other Silicon Valley investors and start-up founders took a trip to Beijing and Shenzhen, two cities that are competing for the title of the Silicon Valley of China. Organized by the venture capital firms Basis Set Ventures, Index Ventures and Silicon Valley Bank, it was intended to help them understand how China has become a tech rival to the United States in barely two decades. Silicon Valley once saw China as a copycat, but it now has some of the world’s biggest and most powerful internet companies. It has more unicorns, or privately held companies with valuations of over $1 billion, than the United States. The China offices of venture capital firms like Sequoia Capital now manage bigger funds than their American headquarters. Silicon Valley luminaries like Michael Moritz of Sequoia Capital have been urging American entrepreneurs and investors to learn from China’s work ethic, ambition and technological advances. The Americans got upfront lessons on how quickly China embraced mobile phones, electronic payments and video streaming, and how intensely it has pursued artificial intelligence. It started the moment the group members entered their rooms at the Park Hyatt Hotel in Beijing’s central business district, where a notice listed some of the websites they would be unable to call up “due to Chinese internet regulations”: Facebook, Instagram, Twitter, YouTube, Google, Bloomberg and The New York Times. Online payments represented another telling metaphor. Mobile payments are almost ubiquitous in the biggest Chinese cities, but setting up an account requires a local mobile number and a Chinese bank account. 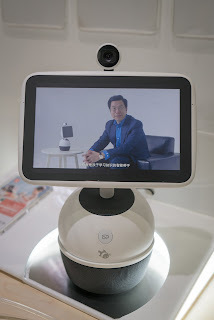 One afternoon they were desperate for caffeine and spotted a Luckin Coffee outlet, an up-and-coming Chinese brand, in the canteen of Bytedance, the A.I. information and entertainment powerhouse. But Luckin takes orders only on its mobile app. At the cashier-less convenience store at the headquarters of JD.com, the online retailer, an employee paid for their snacks with his own phone. Within that walled garden, everything seemed to be moving at an extraordinary speed. While Silicon Valley start-ups raise funding every 18 to 24 months on average, the group was told that the most successful Chinese companies do it every six months. It isn’t unusual for a hot start-up to raise funding three to four times a year. Their hosts kept reminding them of the advantages China had over the United States in A.I. development. China’s vast population and loose privacy laws give them access to much more data. A.I. companies also have considerable government support and are willing to pay more for top talent. But it was also obvious to the group what China was missing. For starters, everybody is Chinese. Even in its early days, Google had employees from 39 nationalities speaking 40-plus languages. Then there are the work schedules. The Silicon Valley natives were introduced to the Chinese start-up concept of 996: Work from 9 a.m. to 9 p.m., six days a week. Once they got over their shock, they had to ask: Does that punishing schedule make sense? While China is becoming more innovative, many members of the group said they believed — and some of their Chinese counterparts agreed — that the United States still led in some areas. Although some Chinese tech companies can look very Silicon Valley-esque — with sprawling campuses that include dining halls, gyms and nap rooms — their preferred management style is still top down and results driven. Unlike Silicon Valley, smart underlings have less freedom to start something new. Underscoring their admiration for strong leaders, the Chinese technology figures told the Silicon Valley group that many in China idolized the Uber founder Travis Kalanick, who resigned as chief executive last year after the company was embroiled in various scandals. The reason: In his battles with a bigger local rival, Mr. Kalanick could be as aggressive and scrappy as a Chinese boss. There was very little discussion about the consequences of Chinese companies’ ruthless focus on growth and the social impact of the technologies they develop — criticism Silicon Valley now faces. The visitors asked how Chinese companies dealt with the issues of censorship and algorithm-driven social media, but their hosts either seemed puzzled by the questions or brushed them off. Technology itself is neutral, some of the Chinese executives said. It depends on how people use it — an argument that Silicon Valley companies used to make. And then there was the surveillance. Chinese companies have little choice but to cooperate with Beijing’s growing efforts to track the daily lives of its own people. Some, in fact, make money off it. Still, the Silicon Valley delegation did not expect facial recognition technology to be so widespread in Chinese life. Companies they visited used it at office entrances and at retail kiosks inside their facilities. They also saw demo videos of how the Chinese police could use the technology to monitor potential crimes in crowded public spaces and learn how many suspects had been arrested. After grasping how prevalent the cameras were, they started counting them. Even the van they rented from the hotel in Shenzhen had a handful of cameras installed, blinking from time to time to signal that they were on. Then, like many people in China, they got used to it, as if the cameras weren’t even there.